Is it okay to soak the scarves in soda ash first, before adding any dye? 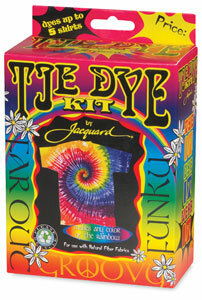 Message: I am doing ice dyeing, where I soak the scarves for 15-min.in the soda ash, and then proceed with the dyeing. My question is…I also want to do some cram jar dyeing…is it okay if the scarves have been soaked in the soda ash first, before any dye is added? I notice that all instructions seem to soak it in the sodium carbonate after the item has been in the dye bath for a while. I am new to dyeing so I’m trying to keep all the various techniques straight. Thank you so much for your help. introduces and explains Low Water Immersion Dyeing with this excellent book, using many beautiful examples. You can add the soda ash at any point in the process—before the dye, with the dye, or after the dye. The effects are a little different when the soda ash is added first, rather than last. The difference is in how quickly the dye reacts with the fabric, and thus how far the dye migrates across the fabric. If you add the soda ash first, then add a fast-reacting dye such as fuchsia (Procion Red MX-8B), then the dye will react with the fabric immediately, wherever it first hits the fabric. If you let the dye soak in for an hour before you add the soda ash, then it will creep along the fabric, and different colors that have been mixed together will separate out. The differences are less obvious with Procion dyes that are slower to react, such as turquoise (Procion Turquoise MX-G). Whether you add the soda ash first or last is a matter of personal preference. Just don’t forget to add it at all! Instead of piling ice on top before adding the dye, some dyers like to soak the fabric in soda ash, then wring it out and freeze it, before adding the dye. This can work extremely well. You should try it each way and see which method you prefer. Other variables in low water immersion (LWI) dyeing, which includes ice dyeing, that affect your outcome include how tightly you cram the fabric into the container. If you want a lot of variegation, and perhaps some white, then you should make sure that the crumpled fabric fits very tightly into your container. For more subtle effects, use a larger container that allows the fabric to remain loose. For a cross between LWI and dye painting, arrange the fabric in a tray. You can use salt in your LWI dyebath, or omit it entirely. To increase the sharpness of the patterns you produce, try adding salt after adding the dye, mixed with the soda ash if you prefer. It is important to allow the dye time to soak into the fibers of your fabric, whether you add the soda ash early or late in the process. If you do not allow enough time for the dye to soak in, then each fiber will be dyed only on the outside margin. This is a fault known as “ring dyeing”. The problem is that, while the dyed fabric looks good at first, even a slight amount of wear will remove the outer thin layer of dyed fiber, exposing the undyed white fiber inside, and making it seem as though the dye is not permanent. (This effect is purposefully employed in the clothing industry to make the denim used in blue jeans appear to wear very quickly.) Dye will soak into thin silks much more quickly than into sturdy twills. For a thicker material such as t-shirt-weight cotton jersey, it’s a good idea to allow a full hour to be sure that the dye has had enough time to really soak in, after the ice has melted. Fifteen minutes should be plenty of time for the soda ash to soak in. You don’t have to worry about this if you are leaving your dye to react with the fabric overnight, but it is important if you are washing out immediately after dyeing. This entry was posted in low water immersion (LWI) on September 9, 2014 by pburch.